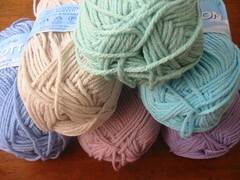 i’ve started swatching for the Very Important Blanket and i’m much becoming much happier about it as the yarns knit up. i was distinctly uninspired by the colours when they arrived, but they handle beautifully and are making a nice soft, relatively drapey (for crochet at least) fabric. i think my design choices will make or break the colours, but used boldly i think they’ll be fine. the book was utterly unhelpful when it came to yardage, refusing to give even the vaguest guidelines - only telling you to swatch, unravel and measure. my 2 test squares weighed in at 16g and 25g for the plain and bobbled respectively, which gives me a minimum of 28 squares if i use every last scrap of each colour, up to a maximum of 40+ if i use lighter, lacier patterns. guage-wise i seem to be working looser than the given guage, but i’m happy to stick with that and have a lighter, drapier fabric. so far the squares are miles off size-wise. 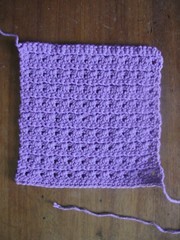 the purple is 6 1/2” x 6 1/2”, the bobbled is 6 1/2” x 7”, both without blocking. they’re a match width-wise, but there’s 2 rows difference length-wise, even having accidentally left a row off the bobbled one. i’ll give them a good wash and see how they shape up, i’m sure i can trim here or add there to make them match. i don’t want to block the smaller one out to the larger size because it opens up the holes in the fabric more than i’m happy with. 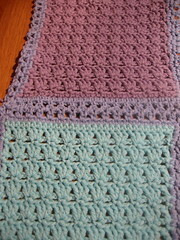 whilst i’m happy design-wise with both blocks i’m not convinced about the practicality of either: the lacy one is absolutely as lacy as i dare go for a baby blanket - i know i wouldn’t have been happy using anything with any bigger holes for a young baby. 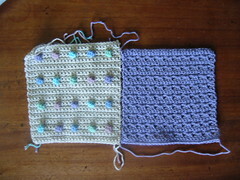 then the bobbly one is a little heavy (though i hope the cotton will soften on washing) and a little - well - bobbly. it’s not really lumpy and would be fine as a cover but not ideal for a baby to lie on. i made a previous sample working the bobbles on the right side of the fabric rather than the reverse and wasn’t happy that they were bobbly enough, so reworked it from the reverse as instructed. now i’m thinking that we might be better with a little less relief. and more. 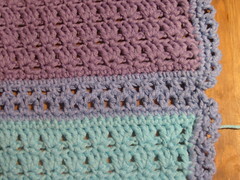 i decided the bobbles just aren’t going to work in the body of the blanket, though i’m holding out hope for a bobbly border. i’m going with the more flexible, lacier vibe, but i’m still vacilating about tiny fingers and holey blankets. 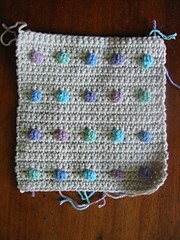 think i’ll show the swatch to some friends with recent babies, see how they feel about it. virtually flat and totally double-sided. it’s not even as tricky as it looks - making sure i had an equal number of stitches on every side to start with was the hardest bit. while that’s not strictly necessary an Important Project brings out my perfectionist tendencies. speaking of which i’m not totally happy that i’m heading for a simple patchwork of solid colour blocks, but all the blocks in the book that have interesting colour work are either very holey or worked in sc (or dc, i’m finding getting used to uk terminology a challenge, i keep mentally translating everything, since all my recent crochet has been done from us patterns). but then i don’t have a great range to work with in the first place - they’re all so similar value-wise i think any patterns would fall quite flat anyway. so the project veers away from my initial plans, but hopefully towards something that’s workable, and (though i say it myself) is shaping up to be quietly lovely. and believe it or not all this apparently aimless rambling does help me sort through my numerous thoughts on the project quite productively.